When the boyfriend and I bought our house, we decided we needed to find a kitchen table and chairs on the cheap. So we picked up a beauty* set at a garage sale for $30. *I say this in the absolute loosest sense of the word, because they're horrific. The set sat in a barn until we were ready to move them. In fact, only two of the four chairs have made it to our house so far (we've lived here 10 months!) and the table will likely never cross the threshold as we have a much nicer antique one that I somehow forgot that I had already. Yes, that is clear vinyl protecting the fabric. 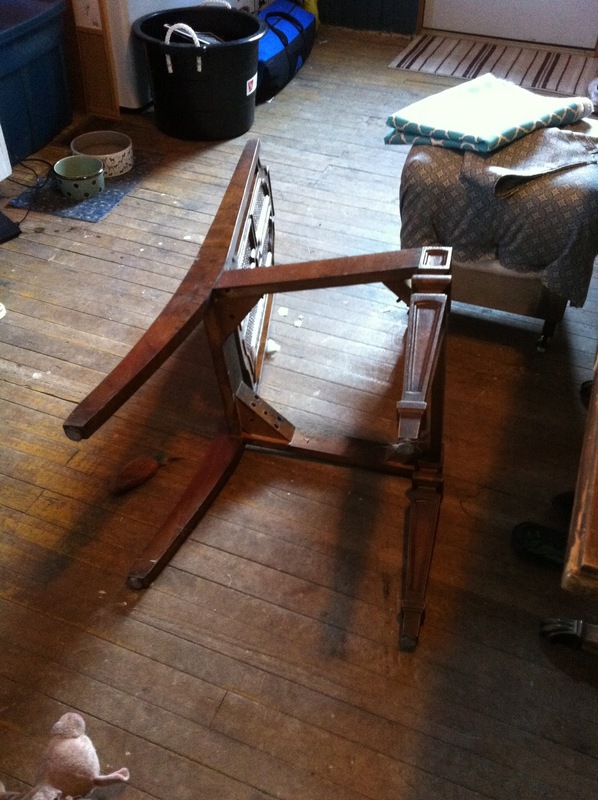 Recovering a chair seat is one of the easiest things to do, ever. As long as you have a staple gun. Purchase some fabric that you're fond of. I don't know enough about fabric types right now, so I just go for patterns that I like. The pattern I chose yesterday is actually outdoor fabric - on sale for $5 a meter. Unscrew the seat from the bottom of the chair. ﻿On the first chair, I actually just ripped the seat off without unscrewing. Don't do that. Remove the staples, freeing the seat from it's vinyl tomb. 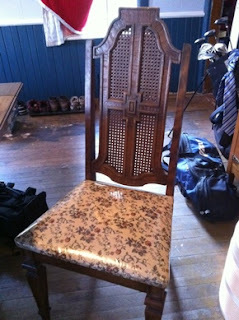 ﻿Because the seats were actually in good shape cushion-wise, I didn't bother removing the outdated fabric. If I had of chosen a light coloured fabric, I would have removed it to ensure that it didn't show through. 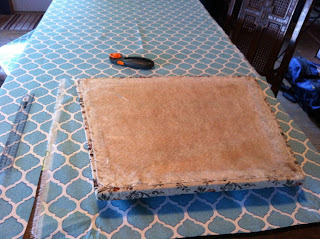 Lay your vinyl free seat upside down on your fabric (the pattern side of the fabric should also be upside down!). Before cutting, ensure that you have enough overlap to completely cover all sides of the seat. 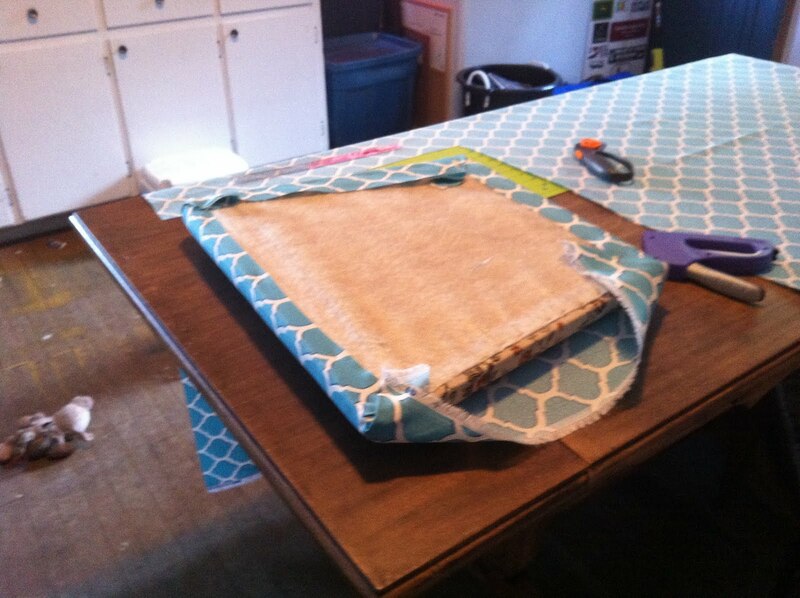 If you have a fairly large or bold pattern, do your best to center the pattern as well before cutting. 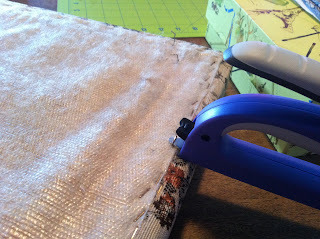 Bring the fabric up over the seat, stapling in place. I did the front and back first, followed by the sides. I did my best to ensure that the folds in the corners were as close to symmetrical as possible. Which I think looks a million times better, and is a nice punch of colour. 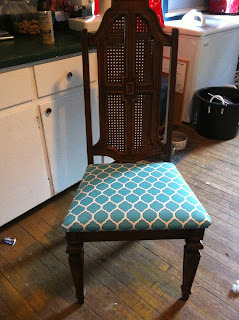 Now I just need to decide what to do with the backs (because, well, they're still ugly chairs). Which aren't wood, by the way. They're plastic.